Posted by Christa Cwiek on September 7, 2011 in Lifestyles. As the 2011-12 school year begins, so does Kappa Kappa Psi, a new music fraternity/ registered student organization on campus. The RSO existed on Ferris’ campus for a couple of decades, but disappeared in the early 1990s due to the music program and the entire university taking a major financial hit. Progress toward getting the group formulated again was brought about by Ferris students. “Dedicated band students ‘banded’ together to form the fraternity. We wanted to do more for, and get more, from the music program at FSU. All of us had previously been very involved in music and wanted to continue to share our love of music and help others discover their love of music,” said Pam Kurylowicz, FSU psychology graduate and former member of KKY. The RSO portion of the group started in 2009-10; the group is now nearing completion of becoming a fraternity on FSU’s campus. “Before we could become the KKY fraternity we had to go through a trial period where we were known as a colony of KKY, which was just the time period when we learned what we needed to do as a group to be considered a true fraternity,” said Drew Heath, one of the original organizers of KKY and the first president. Kappa Kappa Psi members, for the first time ever, worked this summer on calling students who had band experience back in high school or at other colleges that they’re transferring from and trying to inform them about the band program to get them signed up. “Wherever there has been music there have been friends,” said Kyle Maneke, history education major and former member of the group. The group is hoping to complete the third and final ceremonial degrees early this fall and become a full-fledged chapter. They have completed the requirements for being an RSO and will be actively recruiting new members to be part of this new band fraternity. To become a member, a student must be able to play an instrument and be part of one of the university bands. 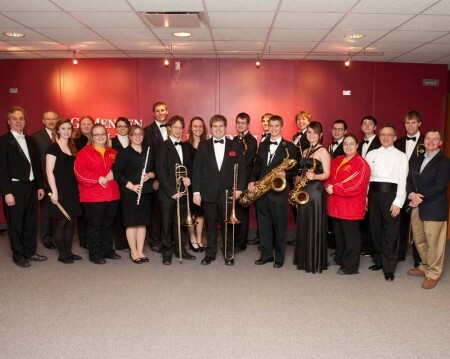 There are several to choose from, including the athletic pep band, symphony band—which is the concert band in which most students begin—another concert band referred to as the concert band that is a 50-50 split between Ferris students and community members, and the jazz band. “Music is an important part of my life because it gives me an escape from the normal wears and tears of college life. It also has allowed me to befriend people that are in different programs than I am and has diversified my college experience,” said Logan May, professional golf management major and one of the founding members of the group. Heath has passed on the title of president this year to Eric Watson, a Ferris student majoring in pharmacy and last year’s treasurer of KKY. “KKY was initiated in order to promote and increase the size and quality of the music program,” said Watson. “Music serves as a way to forget about those everyday stresses that plague all us college students. More importantly, music has provided the opportunity to form bonds with others so strong it’s as if they were my own family,” said Jason Dunk, member of Kappa Kappa Psi and senior in forensic biology and biotechnology. Dr. Cohen believes that it is important for students to get involved with music immediately when they arrive on campus. Taking part in music at Ferris also helps students to meet others with similar interests from all over the country. “Music is my creative outlet. It’s more a part of who I am than my name! I think it would be hard to find someone who doesn’t like music of some type; it’s a universal language that spreads across culture and continent,” said Kurylowicz. For more information about KKY or getting involved with music at Ferris, contact Dr. Cohen at cohenr@nullferris.edu.